looking at the TAPR board too. 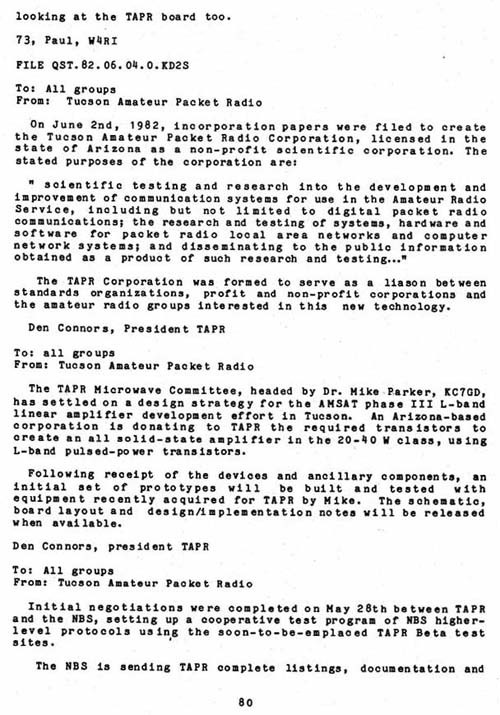 "scientific testing and research into the development and improvement of communication systems for use in the Amateur Radio Service, including but not limited to digital packet radio communications; the research and testing of systems, hardware and software for packet radio local area networks and computer network systems; and disseminating to the public information obtained as a product of such research and testing ..."
The TAPR Corporation was formed to serve as a liaison between standards organizations, profit and non-profit corporations and the amateur radio groups interested in this new technology. The TAPR Microwave Committee, headed by Dr. Mike Parker, KC7GD, has settled on a design strategy for the AMSAT phase III L-band linear amplifier development effort in Tucson. An Arizona-based corporation is donating to TAPR the required transistors to create an all solid-state amplifier in the 20-40 W class, using L-band pulsed-power transistors. Following receipt of the devices and ancillary components, an initial set of prototypes will be built and tested with equipment recently acquired for TAPR by Mike. The schematic, board layout and design/implementation notes will be released when available. Initial negotiations were completed on May 28th between TAPR and the NBS, setting up a cooperative test program of NBS higher-level protocols using the soon-to-be-emplaced TAPR Beta test sites.